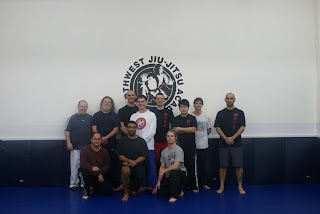 Rigan Machado Seminar a Huge Success! 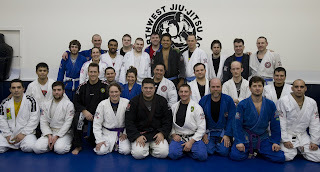 Brian Johnson and I wanted to thank everyone who made Rigan Machado's first visit to NW Jiu Jitsu Academy a huge success! Rigan had a blast, and was very proud of the skill and hard work displayed by all of Brian's students! I heard Rigan compliment Brian privately several times on how strong of a school he is running, and how proud he is to have him as part of the Machado family! Make sure to check back frequently for seminar announcements as Brian and I plan on bringing more and more quality grappling and striking coaches to the PAC NW! Thanks to all who attended and helped with making Tim's first visit of 2009 a success! See you at the next seminar! Many of you have asked about videos of Brian J. 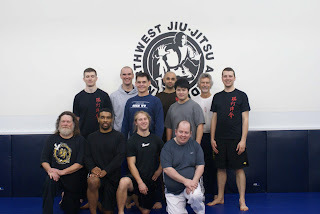 (Mr. BJJ) Johnson of NW Jiu Jitsu Academy - Seattle, WA. (my grappling coach and good friend). Here are three of his fights from Grapplers Quest 2008 where Brian took the championship belt once again (2 years in a row)! The most amazing thing about this win was that Brian was sick with the flu all weekend long! Losing weight, fighting dehydration, and holding "both ends" closed tight Brian went on to tap all four (sorry we do not have the first fight on tape) of his victim's in under two minutes each!!!! Arm bar, triangle, triangle, and triangle! Here is a shot (Thanks Guv') of me using a bridge to defend / escape from a Mata Leo (Lion Kill choke) during the 1st Arlington Submission Challenge in Arlington, WA. This was my first no gi tournament, and the first time I fought in the absolute division (hence the size difference;). Ryan took my back and was originally working his left arm across for the choke, my response was to bridge hard and fast AWAY from the attacking arm over his right shoulder. As the shot was taken he had already adjusted to start to bring his right arm around. I knew this and defended successfully. Unfortunately a few minutes later he caught me with a arm bar! Make sure to train your bridges. I prefer not to twist on my neck, but I practice all other variations. It is a valuable strengthening exercise that is obviously very applicable! This is a standard defense against Mata Leo chokes, especially when you are long and big like me. Though I lost, I learned a TON from this tourney! I later found out that Paul was a 8+ year brown belt under Marcello Alonso. I think I did alright against someone with 6 more years, and two belts on me! The absolute division was the last of the day and when you fought it was the only match happening, so all eyes were on you. Honestly I did not think of it until afterward, but it was good experience none the less for one day I am sure I will fight a match much bigger, and much more important! Good to get the nerves and head games figured out sooner than later! After too many headaches, lots of late nights followed by early mornings, and much to the thanks of Dana, Three Harmonies Martial Arts Center finally has a brand new website www.threeharmonies.com that is completely updated with information, photos (again, mucho thanks goes to Dana www.dkbimages.com), and of course this brand new blog! As if I was not opinionated enough, now I have an "un-official-official" blog! 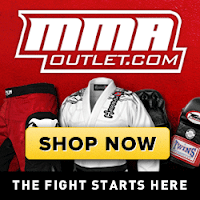 I hope to offer my thoughts, opinions, reviews, and what few facts I know regarding all things martial, a few things not so martial, and a number of absurd oddities! If you like it, subscribe to my blog! If not, nice of you to stop by! I would like to dedicate the blog to a teacher who was a great influence early in my life. 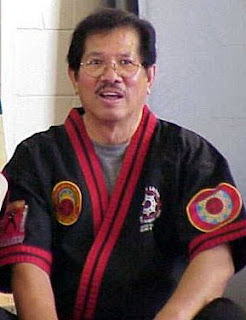 Prof. Remy Presas passed on a few years back, yet some of my fondest memories of intense training, martial brotherhood, and lessons learned came from my few visits with him over 4 years. I would participate in his summer camps in Michigan, and Windsor, ON. training stick, knife, empty hand techniques for 10-12 hours a day! Our wrists were swollen to double their normal size every night! Yet we went back for more, with smiles on our faces! Remy taught me so much I cannot share all the details, but one thing that sticks in my mind, and has shaped my life to this very day is his unquenchable thirst for knowledge, and his childlike attitude about training! He always encouraged us to "play" with ideas, techniques, and challenge what we "know." Remy would constantly remind us not to get too narrow with our views and understandings, challenging us to train in different styles so to deepen our martial understanding. Our teachers are not immortal. They do fade away into another realm, and it happens all too fast as days and nights pass. I always thought I would train with Remy again, and so I never took a picture of him and I together, and more importantly I never told him how influential he was on my life! Both things I regret now that he is gone. So make sure to tell your teacher how much he/she has influenced your life, and get a picture with them before it is too late!